Use this reading and coloring worksheet to help make your kindergartner’s early reading as engaging and fun as possible. 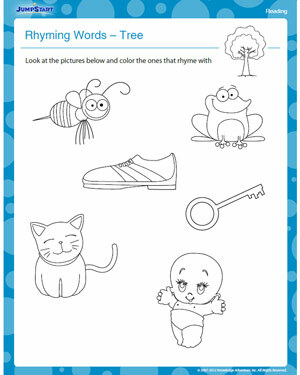 'Rhyming Words – Tree' teaches kids to read, color and recognize rhymes with the help of images rather than words. All they have to do identify words that rhyme and color the pictures.